You can view the AV-Comparatives chart for details and other categories tested. These tests involve a very large sample of diverse malware. The advanced+ rating in heuristic/behavioral test clearly demonstrates that our products are capable of dealing with zero-day malware which is the greatest cyber threat of today. Emsisoft Behavior blocker is capable of dealing with new and unknown malware which eliminates the long response time to threats, meaning you don’t have to wait for us to analyse and make a signature for every malware sample. The dual-engine scanner used in Emsisoft anti-malware ensures that we stay on top when it comes to signatures too, and thus we achieved an Advanced+ rating in the file detection test as well. Ease of use and lack of ambiguity in the User Interface along with the fact that Emsisoft can deal with most threats automatically has translated into a very good score in the real world protection tests. We are always working to ensure high detection rates and low false positives. 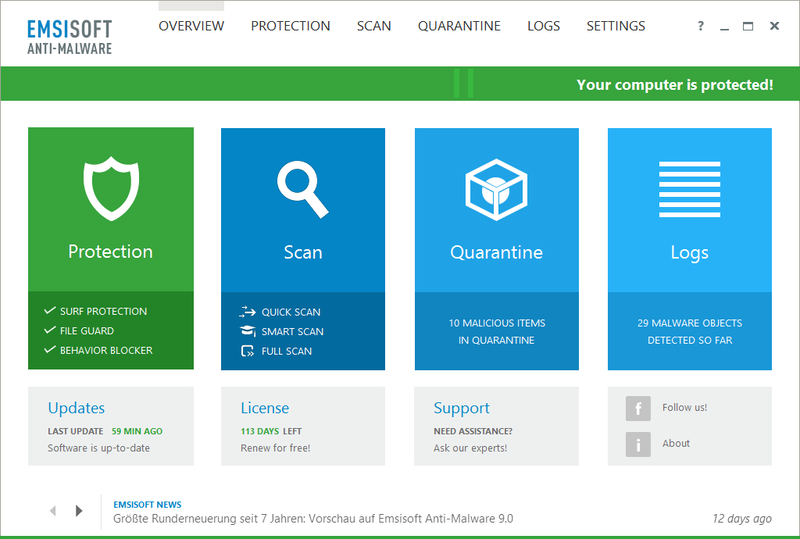 We were very impressed with the new design of Emsisoft Anti-Malware. We feel it does an outstanding job of making important functions easy to access. Installation is very straightforward, and provides useful illustrated explanations of security features, though we would suggest that prompting the user to password protect the settings would be useful. Malware alerts are reassuring and secure. Clearly Emsisoft’s new GUI is getting a lot of appreciation. Emsisoft Anti-Malware 9 comes with a brand new user interface which offers advanced users all the customization possibilities they need while maintaining a very simple and easy to use home screen that allows basic users to view and change the status of any of the security components, or start any of the basic tasks like scan and update with a single click. Emsisoft has a very clean and easy to understand installer, which is not something every security product offers. It also includes a detailed help file. We are constantly getting better! The 2014 results are very pleasing but as always we are not stopping here. As we head into 2015 we are focused on further improvement. We are constantly taking feedback from reviewers, users, different members of the team and using it to improve our products in order to make sure we offer nothing but the best. Our aim is to get the product of the year award next time.